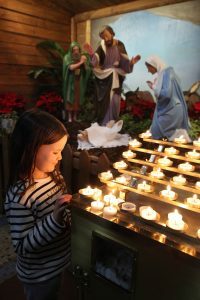 Sadhbh Tanney (6) from Dublin admiring the candles and crib after Christmas morning Mass in the Pro Cathedral Dublin. Pic John Mc Elroy. The plight of homeless, migrant and refugee families should be in our Christmas thoughts and prayers, Archbishop Eamon Martin said in a message of solidarity with the marginalised this Christmas. Addressing the faithful in his Christmas homily at St Patrick’s Cathedral Armagh, the Primate of All Ireland also expressed concern for families caught up in war or violence in various parts of the world. But, by choosing to be part of a human family, God took to Himself the pain and struggles of family life, he said. Archbishop Martin said he was always conscious of the sadness in many homes at Christmas time, when the hurts and feelings of family regret, disappointment, separation, or even anger, can resurface painfully at this time of the year. In Dublin, Archbishop Diarmuid Martin told the congregation at Christmas Mass in St Mary’s Pro Cathedral, that even the most hardened heart cannot but feel a certain sense of tenderness by the Nativity. He said most people, despite the rampant commercialisation of Christmas that dominates society for months each year, are captured by the deeper message of Christmas on Christmas night. The Archbishop warned that darkness has not yet been dispelled and that we are living in a world where peace is more than fragile, where conflicts rage and fester and where the responses are often phrased in a language that is inflammatory rather that words and deeds of peace. 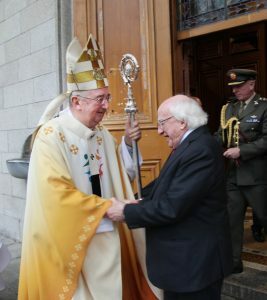 Archbishop Diarmuid Martin greeting President Michael D. Higgins after Christmas morning Mass in the Pro Cathedral Dublin. Pic John Mc Elroy. “There are new signs of violence in Ireland. There is the arrogant violence of that business of death, the drug world, which is unscrupulous and despicable. There is the continued violence of stabbings,” Dr Martin warned. The Archbishop of Dublin appealed for “courageous and decisive plans and sufficient funding to overcome the suffering and the deprivation of those who live on the precarious margins of society”. In Christ Church Cathedral in Dublin, Archbishop Michael Jackson underlined that Christmas asks believers to combine right thinking and right doing and to continue this long after the festive season has passed. In his Christmas Day sermon, which he delivered during the Festival Eucharist, the Church of Ireland Archbishop of Dublin said that in a democracy, it is important that respectful discourse continue to be developed and enriched. “It seems important also, in the overall perspective of civic life, that religion as a system should not become the predictable mouthpiece of the negative; it seems equally important that the secular reaction to religion engage with its presuppositions while at the same time, in all likelihood, disagreeing with them; and furthermore it seems equally important that religious people take the scruples and the principles of secular people seriously and attentively,” he said.